At the end of World War II, many American families rejoiced in the defeat of Nazi Germany and the Axis powers. Others, however, were too busy being swept up in the panic which would develop in regard to the potential cold war between the United States and the Soviet Union. With the threat of a nuclear war on the horizon, Americans looked for ways to protect themselves from the horrible destruction. Of these, many chose to fortress themselves inside of “bomb proof” fallout shelters. 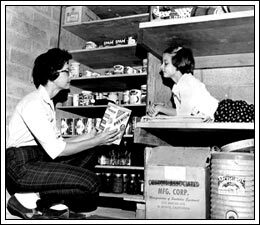 Fallout shelters sprung up across the United States, with many citizens building their own by hand and others purchasing commercially designed and built models from catalogs. 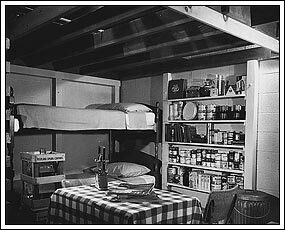 Most looked like basic units, providing space only for necessities (which were generally only two-week supplies) while others looked like small guest houses, equipped with pool tables, paintings and wine cellars. Interest in the fallout shelter reached its peak in the early 1960s as the Cuban Missile crisis loomed and gradually waned in the 1970s as various treaties and agreements by the super powers calmed American fears. The Fallout Shelter succeeded as a comfort to much of the population and as a money generator for an opportunistic new industry.